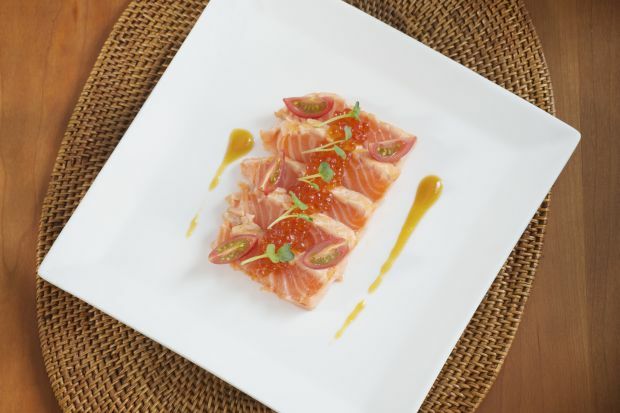 SALMON is considered a delicacy and sought after all around the world. Norway is the world’s second largest exporter of seafood, mainly for salmon and cod. They have a profound history of salmon farming and are well-equipped with salmon breeding technologies. Salmon is not only flavourful but considered one of the healthiest fish to consume because of its high content of omega-3 fatty acids. The salmons are kept in open cages that are located in the seas of Norway. Only 2% of the cages are filled with salmon so that they are free to move around comfortably. A happy salmon will be tastier. Norwegian salmons are not frozen to export, instead, they are exported fresh. The whole fish is placed in a polystyrene box filled with ice. 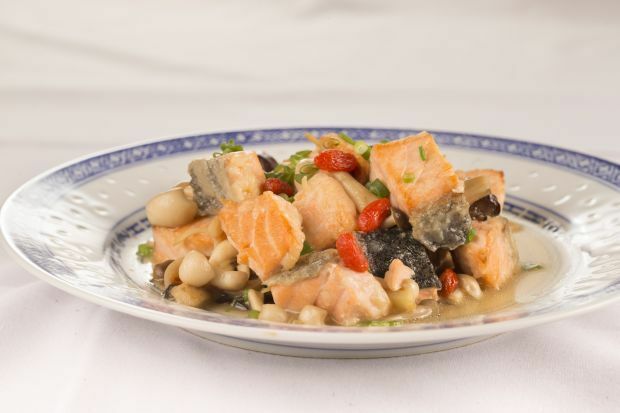 It is a versatile fish to work with, says award-winning chef Jimmy Chok. Chef Jimmy has worked with salmon for almost eight years. Today, he is the consulting chef for the Norwegian Seafood Council in salmon training program for retail markets in Singapore, Indonesia, Thailand and Taiwan. When it comes to cooking, he is best known for this innovative approach that blends Asian ingredients with Western methods. Chef Jimmy shares basic steps and tips when it comes to storing, filleting and cooking salmon. If you are buying salmon as a whole in a box, specifically in a polystyrene box, make sure to check the condition of the ice that’s in it. If most of the ice has melted, replace them immediately and place it in the freezer. 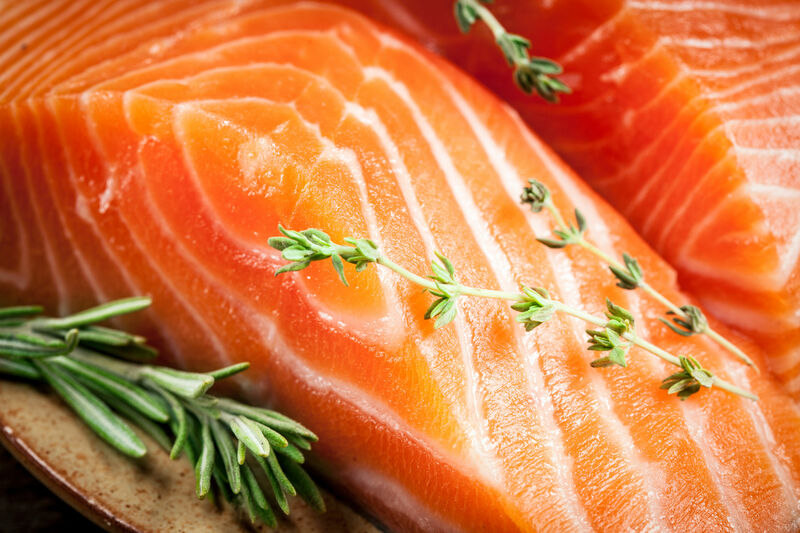 Since salmon is an oily fish, it tends to deteriorate quickly and this shortens its shelf life when it comes to contact with water when stored. On the other hand, if you are buying salmon fillets from the groceries, wrap them up compactly with plastic. Make sure that there is no air bubble because air bubbles will cause water droplets to form. Then, store it into your freezer. Do not wash it before storing. Only wash it when you plan to cook it. If you bought salmon as a whole, you must cut the head off first. A common mistake people make when cutting the head off is that they tend to cut the head off with as little flesh as possible. Leave some flesh on the head as well so that the head does not go to waste. Salmon heads are filled with flavours. You can make fish head curries, stocks or simply toss it on the grill. Here comes the tricky step. Using a good and sharp knife, cut tightly against the backbone of the salmon. Once, it is done, you will be left with the whole backbone and the tail. Keep in mind that there will be some flesh left on the backbone. Don’t throw it away. Use a spoon and scrap all the excess flesh on the backbone. It can be used to make fishballs, patties, or porridge. There are still lots of flavours in the bones. Keep it to make a stock. It is best to remove excess flesh from the bone before making the stock. Salmon flesh has natural oils in them that will cloud the stock. Trim the rim carefully at certain angles. The belly is the best part. You can sear it on a pan or even toss it on the grill. Use a tweezer to pick out the pin-bone. It is important to pick out the bones first before cutting the fish into fillets. Pick the bones at a diagonal angel to avoid breaking it into the flesh. The bones at the front of the fish are much thicker and longer than the ones at the end. Here’s an important note: If you plan to leave the salmon aside, make sure to put the flesh on the flesh. Do not stack the salmon flesh to skin because there may be bacteria on the skin that can be transferred onto the flesh. This step is up to your preference. If you plan to cook the fish with its skin on, then, you can start cutting it into the cuts of your liking. There are many types of ways to cut your salmon. You can cut it into cubes, fillet, or butter-fly fillet. The fillet at the front of the fish is usually used for sashimi because it has a good balance of flesh and oil. When frying or grilling the front portion, it tends to break apart easily. The end portion of the fish is more suitable for grilling. Cut the meat into cubes to make kebabs. If you want a skin-off fillet, simply cut tightly against the skin to remove. Try deep-frying the skin for a delicious snack. 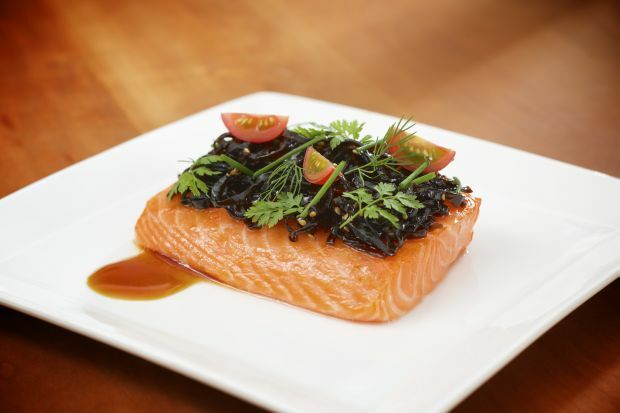 For perfectly cooked salmon, drizzle some oil on the fillet and cook it in an oven at 55 degrees Celcius for 45 minutes. Season after it is cooked. When it comes to seasoning, use ground pepper instead of powdered pepper. Powdered pepper tends to burn easily leaving a bitter taste. Salmon is delicious when it is cooked as an asam pedas dish. The oil in the salmon add tons of flavour that will leave you wanting more. Never use high heat when cooking salmon. When searing the salmon on the pan, avoid flipping it too often. It takes a longer time for it to cook when it is flipped too often leaving you with dried and over-cooked salmon. 1. Seared Salmon with Yuzu Miso Dressing. Click here for recipe. 2. Slow-cooked Salmon with Konbu and Soy Glaze. Click here for recipe. 3. 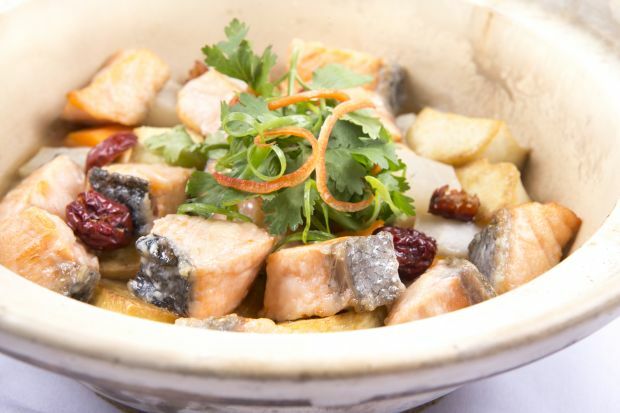 Claypot Salmon with Tofu, Carrots and Radish. Click here for recipe. 4. 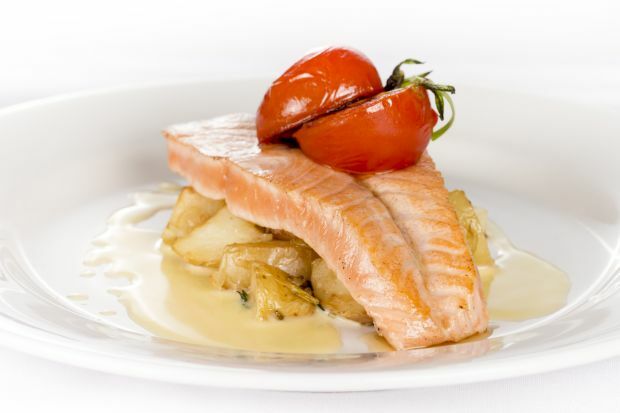 Pan-fried Salmon with Potatoes. Click here for recipe. 5. Fried Salmon with Mushrooms and Wolfberries. Click here for recipe.